The sets of 'Judwaa 2' seem all a happy space for its cast and crew. This David Dhawan film, a sequel to the 1997 'Judwaa', is slated to release on September 29 and is currently in the last days of its shooting, and it witnessed a day of Salman Khan on the sets and everybody just went crazy over it, uploading pictures with the superstar on their social media handles. 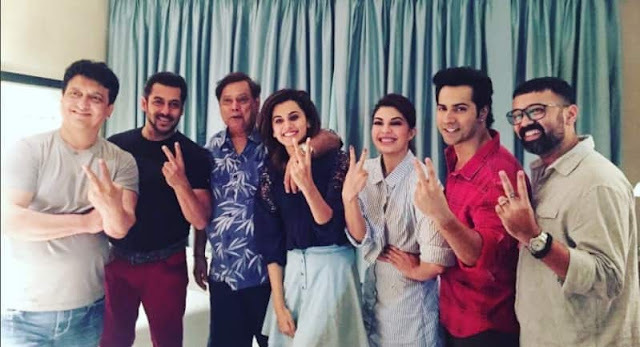 With already an ensemble cast which include Varun Dhawan, Jacqueline Fernandez and Taapsee Pannu in lead roles, among others, 'Judwaa 2' just got bigger with Salman Khan’s cameo shooting on the sets. Earlier Taapsee Pannu had expressed her desire to work with India's superstar Salman Khan and guess what? Her wish has been heard. Yes, Salman Khan was recently on the sets of 'Judwaa 2' to shoot for his cameo appearance in the film. Varun Dhawan took to his twitter handle and tweeted a picture captioning it- "#judwaa2 just got bigger. Shot with my childhood hero @beingsalmankhan. I’ve grown old but he’s definitely the same. Can’t wait SEPT 29th"
Another star of 'Judwaa 2', Jacqueline Fernandez shared a video on her Instagram and worded it in caption- "A picture may say a thousand words but I wouldn’t be able to upload enough to describe today! Around my favourite people who’ve been with me and supported me in my Bollywood journey since day 1! @beingsalmankhan @nadiadwalagrandson #daviddhawan @varundvn @kamera002 @taapsee thanks for being an awesome co star to work with!! @beingsalmankhan thanks for making our film so much more special today!!! Will always cherish these #judwaa2 memories"
Taapsee Pannu, whose wish has finally come true, shared a picture and wrote- "And it happened! Done with my talkie portion for #Judwaa2 #SuperTeam"
Salman Khan has a cameo appearance in 'Judwaa 2'. It is to be noted here that he had played the lead role in original Judwa (1997) which was also directed by David Dhawan. Salman Khan just delivered his film 'Tubelight' which hasn't had quite a run at the ticket counters and is busy shooting his next film- 'Tiger Zinda Hai' starring opposite Katrina Kaif.